The right smart TV can vastly improve your home entertainment, filling your living room with on-demand content from Netflix, Hulu, Amazon Prime, and other streaming companies. But choosing the perfect set for your viewing habits means deciding on the screen resolution, display technology, and of course the platform that will serve as the device’s brains. Smart-TV specs can seem confusing, but we’ve got you covered. Here are the key factors you need to consider before you part with your cash. One of the primary considerations for any new TV is just how big you want it to be. The answer depends on the size of your budget—and of the physical space where you plan to install it. Dig out some measuring tape and write down the dimensions of the living room or bedroom where the television will live. Even if you measure the room, you may still have trouble picturing how the television will fit. To figure out just how dominating your new TV might be, you could use augmented reality to view it in situ, or more realistically, mock up cardboard panels in a variety of sizes. In addition to the size of the wall where the television will rest, you should consider how far away you’ll be sitting as you watch: Sets at the larger end of the scale will overwhelm your eyes if you’re placed right in front of them. There’s no single correct way to calculate the ideal screen size based on viewing distance, although manufacturers and experts do offer some advice. If possible, visit a local retail store to weigh up sizes and distances for yourself. 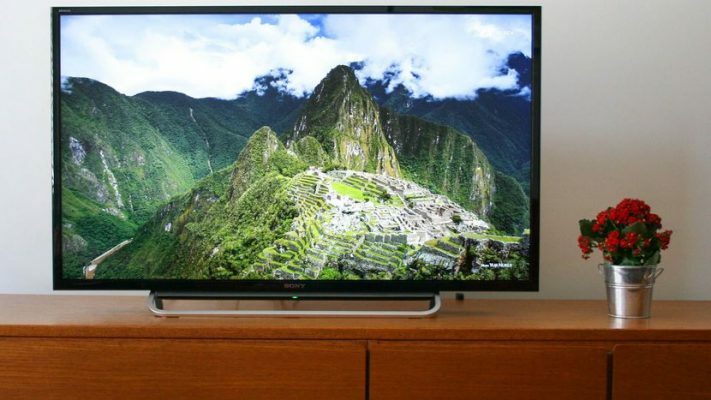 Just like for a laptop or a smartphone, a television’s resolution refers to the number of dots or pixels that make up the screen. The more pixels, the sharper the display—though screen size also affects sharpness, because the same number of pixels across a bigger display won’t look as clear. In 2018, the vast majority of sets you see will have resolutions of 3840 by 2160 pixels, a size known as 4K. You might see some television companies using the term Ultra HD instead, but it’s essentially the same resolution. If you’re getting a small TV, say under 40 inches, it’s not worth investing in a 4K resolution because it simply won’t be noticeable. For anything larger than that, however, 4K is the current gold standard. While 8K is on the horizon, that resolution won’t hit the market for a long time yet (if it ever does arrive). Besides, unless you’re buying a truly humongous television, you won’t really notice those extra pixels. Even the streaming pioneer Netflix is only just making the switch to 4K content, so 8K is still far in the distance. Any television set with a 4K resolution will future-proof you for many years to come. Today’s television displays rely on two competing technologies: the ubiquitous LED LCD and the more expensive OLED. Trying to say which one is best can get tricky, particularly because manufacturers add their own tweaks and proprietary technologies on top of each platform. Plus, as both technologies continue to develop, they improve their strengths and minimize their relative weaknesses. Here’s a (very) general summary of their differences. Both types of screens use LEDs for illumination, but in different ways. With LED LCD, white light-emitting diode, or LED pixels, are used as a backlight to form an image through a liquid crystal display, or LCD filter. The LEDs usually cover the whole screen, but cheaper sets sometimes limit them to just the edges of the display. LED LCD displays are generally sharper than OLED ones, and they also provide more natural-looking light control in scenes. On the other hand, organic light-emitting diode, or OLED, screens skip the backlight and instead light up individual pixels one by one using an electric current. This lets the screen respond more quickly to changing input. In addition, because a black pixel is switched off completely rather than dimmed, OLED displays tend to have better contrast than LED LCD ones. Finally, they’re more expensive to manufacture, which usually leads to more expensive television sets. Although these are the general attributes of LED LCD and OLED screens, as we mentioned, additional innovations from television manufacturers can give one technology an edge over the others. Take Samsung’s Quantum Dot technology: It makes LED LCD screens produce purer colors, much like OLED displays do. With these evolutions constantly hitting the market, the very best LED LCD panels and the very best OLED ones stand equal. To really get a sense of the difference between screens, take a trip to a local store to check them out with your own eyes. Now that you’ve determined how your content will look, it’s time to figure out what that content will be—which means thinking about the platform that will power your smart television. Manufacturers like Samsung, LG, and Panasonic employ their own in-house smart-TV software; Sony mainly favors the Google-made Android TV; and budget brand TCL relies on Roku software. However, the platform actually shouldn’t be a huge factor in your decision. All of the smart TV platforms offer similar sets of features, including access to big apps like Netflix, Hulu, and YouTube. While you might find slight differences from platform to platform—Android TV and Roku have the best app selection, and if you’re familiar with those systems from other devices, you might lean slightly toward a Sony or TCL set—these variations are minor. Making the platform even more of a moot point, you’re better off plugging a Chromecast or Apple TV into your set than relying on the on-board software. An external dongle or box will run faster, provide a better choice of apps, and receive more regular updates than anything on the TV itself. In fact, take the time you were going to spend agonizing over the platform, and spend it checking the number of ports on your TV to make sure you can plug in all the peripherals you’ll want to connect. One exception: If you’ve already invested heavily in Google products and software, then a set that runs Android TV is the obvious choice. All the personalized data from your apps, including your YouTube history and your Google Photos, will easily sync with your new device. Plus, you’ll receive bonus features such as built-in Chromecasting and the ability to mirror your Android smartphone on the television. That said, if you live in the Android ecosystem but fall in love with a television that uses another platform, go ahead and enjoy your Romeo-and-Juliet romance—the smart TV platform should not be a dealbreaker. Figuring out what you want from the basic specs we’ve mentioned will help you narrow down your smart TV choices. With that done, check whether the sets on your shortlist include some of these picture-enhancing features. For example, some screens include high dynamic range, or HDR. This brings out the detail in the darkest and lightest parts of the picture and improves the range of colors. Check to make sure the sets on your shortlist support it. While you may find competing HDR standards, such as HDR10 versus Dolby Vision, any HDR support can provide a better-looking display. You also should consider the refresh rate: literally he number of times the TV display refreshes every second. For instance, a rate of 60Hz means the image resets 60 times per second. More refreshes will give you a sharper image and less motion blur when you’re watching fast-moving action and sports. When you’re checking the specs, watch out for numbers labeled “effective” refresh rates—terms like these could be exaggerated marketing phrases that don’t reflect the panel’s actual rate. Most smart TVs will also apply some clever technology to reduce motion blur. You’ll find this type of effect under a name like motion or frame interpolation. However, the technology may or may not look good to your eyes: It can dial down the blur so much that everything gets a razor-sharp, cheap-looking sheen known as the soap opera effect. The good news is that these motion blur effects are optional, so you can disable them if you dislike them. You’re almost ready to make your final choice—but there are a couple more features to consider before you go ahead and buy. For example, though few TV manufacturers focus on sound quality, that feature will have a big impact on your viewing enjoyment. Audio buffs might hold out for a superior standard such as Dolby Atmos, an attempt to create an immersive, surround-sound experience in your living room. However, it will only be available in certain high-end sets—most TV makers assume that serious audiophiles will invest in a separate soundbar. Another badge of approval that we recommend you look out for is Ultra HD Premium. This is a set of standards, defined by the UHD Alliance industry body, that specifies a minimum level of quality in terms of color, refresh rate, brightness, and audio. It guarantees a certain pedigree in a set, and factoring it in can reduce the length of your TV shortlist. Finally, the more reviews you read, from both users and professionals, the better. While it’s useful to know what all the standards we’ve mentioned actually mean, you can still find a high-spec TV with terrible picture quality or a lesser-spec TV that exceeds expectations. In other words, specs can help narrow down your choices, but they don’t necessarily tell you whether one specific TV is better than another. Because a set’s quality doesn’t shine through until you’ve had the experience of using it, user reviews really help. Ultimately, your available budget may be the best way to clear the field. Once you’ve limited your options to a set price range, you can start weighing up the factors we’ve discussed. Certainly consider the specs defined above, but the only must-haves that we recommend are a 4K resolution and HDR. Apart from that, make sure the reviews are solid, and don’t sweat the details too much. Even a slightly older set is worth considering: Because televisions have long shelf lives, particularly compared to more frequently-updated gadgets like smartphones, your smart TV won’t suddenly become obsolete in just a few years.